Decorative tape rolls in a display caddy. 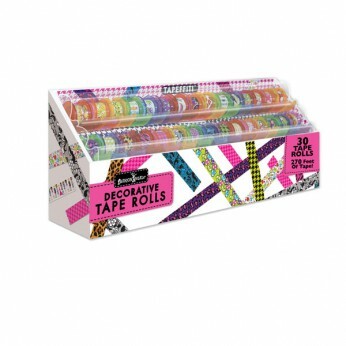 30 tape rolls in cool designs. Colours and styles may vary. 9ft of tape on each roll…. This toy costs approximately £7.99 (for the latest and best prices make sure you check our retailer list for the Tapefetti above). In our review of Tapefetti we classed it as being suitable for ages 6 years, 7 years, 8 years but recommend you check the manufacturer specific advice before purchasing.